Enjoyed my stay: clean hostel, friendly staff, good value for money, nice atmosphere. Very good atmosphere! Mina and Andrew made sure that our stay was very nice! Probably this is one of the best hostel I’ve ever been with. The customer service is excellent. The location is in the beautiful street and very accessible. The couple who runs the hostel knows what the travellers need and that’s very important. I also like the setup of the hostel as it encourages interactions between guest and you will never left alone. I actually stay there twice. I will come back to Tbilisi and will definitely stay in the Marco Polo hostel again. Wonderful, calm and cosy hostel. Mina and Andrew are very warm and welcoming, you’ll feel right at home! Great location and incredibly clean too. The perfect hostel. Everything you could want or need as a solo traveler, and Andrew and Mina are wonderful people with suggestions for anything you'll be able to think of while you're in Georgia. The hostel and its team deserve no less than 10.0! The small hostel is well located with comfy bunk beds and hang-out area. Highly secure with its 24-hour reception availability. The bus running to/from airport is also very close to the hostel. They are also well-versed with any travel needs you require for the neighbouring countries. The complimentary breakfast was a nice touch as well! Definitely re-booking when I come back to Tbilisi. Thanks Andrew, Mina, Adam and Ramz! It was an absolutely lovely stay. Nina, Andrew, and Adam do a wonderful job of being patient with all of them questions, requests and re-telling of stories or information. Hostel is clean, homey ...and I think the perfect size. Only area of improvement is having a place to store luggage which is locked away. Marco Polo was my home away from home! Andrew, Mina and Adam were all lovely and super helpful if I had any questions. 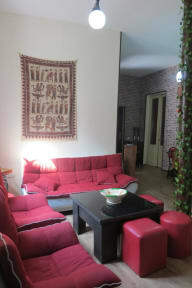 The location is central (5min to the metro and 10-15min to the old town) and everything was clean. If I come back to Tbilisi, I'll definitely consider booking here again. N.B. I booked the private twin room which didn't have a lock on the door, but I was emailed about this immediately after booking so there was no problem, especially considering I had plenty of locker space. Awesome hostel, Mina and Andrew are great and you easily meet people there. Amazing value for what you get including a good breakfast. Definitely recommend it!